A LOCAL technology solutions company has partnered with a leading Asia Pacific business solutions partner in its bid to provide quality services tp Fiji’s ICT sector. The fairly new company – ACTON (Fiji) Pte Ltd – has formed a strategic alliance with MicroChannel Services Pty Ltd. This will mean that that ACTON will work together here and throughout Asia Pacific to bring high levels of customer satisfaction and an unparalleled commitment to quality ICT solutions. According to MicroChannel chief executive officer Harach Lucas the partnership would take ACTON from strength to strength. “Working together enables us to better participate in and support the Fiji market, including delivering the latest technologies from Microsoft, SAP, Sage and other key ICT suppliers,” Mr Lucas said in a statement. MicroChannel is a multi-award-winning business solutions and technology provider, servicing mid-sized to large businesses, corporate divisions, government agencies and enterprise organisations. “Locally, both companies will continue with their respective names and use this exciting new partnership to bring our combined capabilities to the market,” Ms Reddy said. 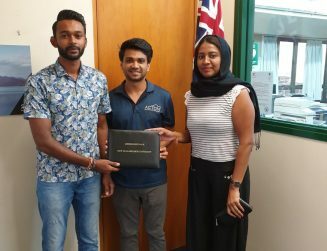 ACTON was formed in July 2017 with young passionate Fijian entrepreneurs. With 14 employees, ACTON provides subscription based, cloud based technologies.